On my latest attempt at making an Australian stockwhip, I wanted to imitate the look of a whitehide stockwhip. 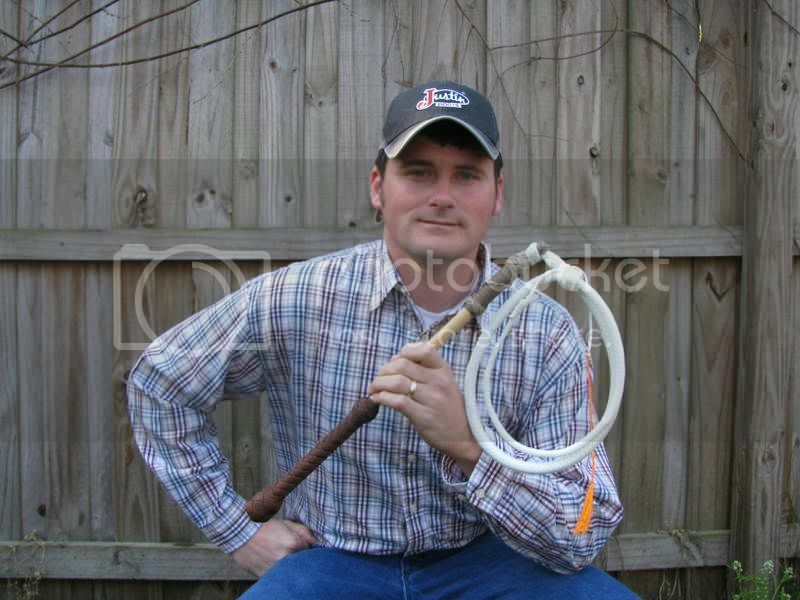 The whip I am holding in the photo there is the result of that endeavor. 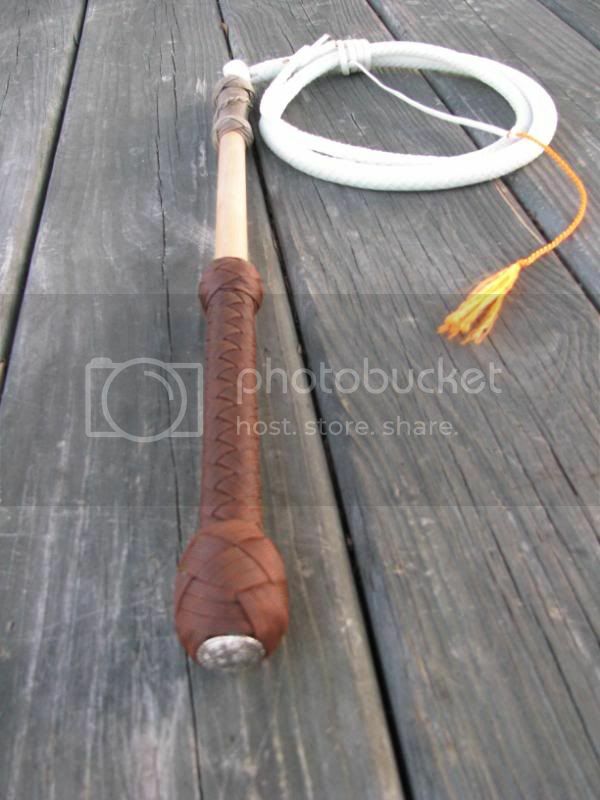 Like my first nylon stockwhip, this whip has a 4ft thong and the handle was built on an 18 inch, 5/8″ hardwood dowel. The handle is 16 plait in a double-diamond pattern. 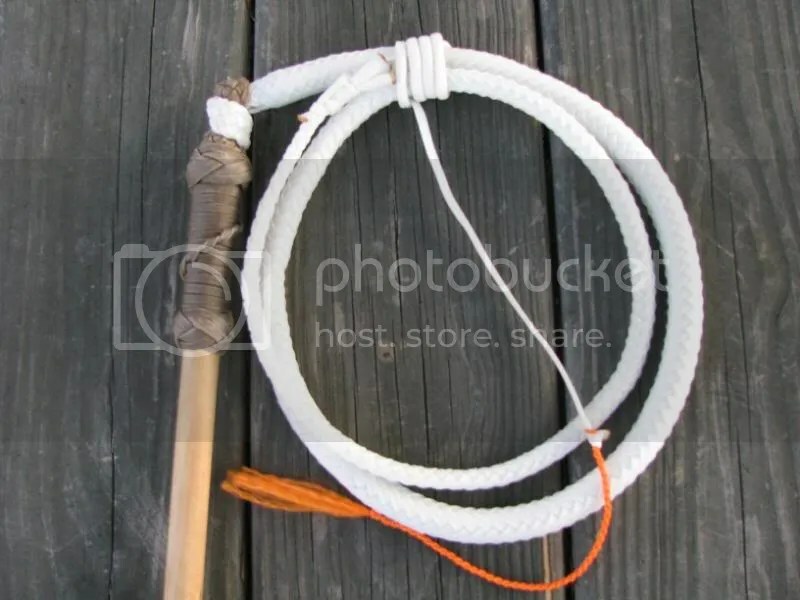 The biggest problem with my first stockwhip was that my keepers were way too long. I remedied that somewhat on this whip and I also did a “grapevine” on the whip handle just below the keeper. I am already planning for my next nylon stockwhip. On the next project, I will be trying my hand at using some toheti cane for a handle instead of a hardwood dowel. I recently purchased 3 pieces of cane from Paul Nolan (midwestwhips.com) for my upcoming stockwhip projects. On last thing, below is a banner that Robby Amper asked Holger (the Whip Basics webmaster) to make up for me. They said I can use it as I wish, so if you would like to use it on a web link page, then help yourself to it! This entry was posted on Thursday, February 26th, 2009 at 6:36 am	and posted in Australian Stockwhip, nylon whips, Projects. You can follow any responses to this entry through the RSS 2.0 feed. « Taking Orders for Whip Basics Now!